Copyright 2014 The Authors-Ecology and Evolution published by John Wiley & Sons Ltd. This is an open access article under the terms of the Creative Commons Attribution License, (CC BY 3.0 AU) which permits use, distribution and reproduction in any medium, provided the original work is properly cited. Callitris intratropica and other fire-sensitive components of the regional flora and fauna, due to proliferation of flammable native grasses. We tested the hypothesis that a high-biomass invasive savanna grass drives a positive feedback process where intense fires destroy fire-sensitive trees, and the reduction in canopy cover facilitates further invasion by grass. 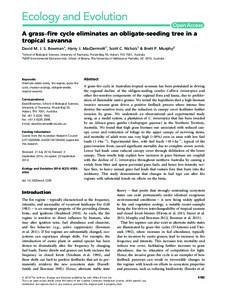 We undertook an observational and experimental study using, as a model system, a plantation of C. intratropica that has been invaded by an African grass, gamba (Andropogon gayanus) in the Northern Territory, Australia. We found that high grass biomass was associated with reduced canopy cover and restriction of foliage to the upper canopy of surviving stems, and mortality of adult trees was very high (>50%) even in areas with low fuel loads (1 t·ha−1). Experimental fires, with fuel loads >10 t·ha−1, typical of the grass-invasion front, caused significant mortality due to complete crown scorch. Lower fuel loads cause reduced canopy cover through defoliation of the lower canopy. These results help explain how increases in grass biomass are coupled with the decline of C. intratropica throughout northern Australia by causing a switch from litter and sparse perennial grass fuels, and hence low-intensity surface fires, to heavy annual grass fuel loads that sustain fires that burn into the midstorey. This study demonstrates that changes in fuel type can alter fire regimes with substantial knock-on effects on the biota.